Day 1 of New York Comic Con is over and this year is already shaping up to be one crazy year. Preview day has been one of my favorites for the last few years because it gives you a chance to cover the entire floor show with fewer people and really get a good feel for what’s out there before the craziness that is Friday and Saturday. With the addition of Thursday Only passes this year, preview day was a bit more challenging due to the increased number of people. Don’t get me wrong, I’m glad they did these passes because that’s how I got in (maybe next year I won’t procrastinate about buying a four day pass), but it did increase the difficulty in moving around. The view from my spot in row seven. There were several more rows after me. Despite the increased population, I managed to cover the entire convention, moving at a brisk pace. Its great to see both old and new faces. I’m certain that Harvey Yee’s Rare Comics has been at every convention I’ve ever been to. Rooster Teeth and Cyanide and Happiness are both here and already had noticeable lines forming at their booths. All the major comic publishers had sizable booths which of course were already becoming traffic nightmares. I’m very excited to see that an increase in the quality of the small press this year. I’ve already picked up two different small press comics. One is a science fiction piece and the other is set in feudal Korea. Two very different books, but both appearing to be of quality. Artists Alley looks really good this year with many big name artists (I already bought an Humberto Ramos print) as well as some really good looking, though less well known artists. I’ve already got a mental list going of prints I want to get. I’m thinking this year might be a Star Wars year. Ramos is one of my all time favorite artists. Looking ahead to Day 2, I’m planning to get started with some autographs and then the Comic Book Legal Defense Fund’s panel on the secret origin of censorship in comics. Day 2 will also be much more social as most of my friends will be showing up, so I’m anticipating some additional crazy thing to happen. 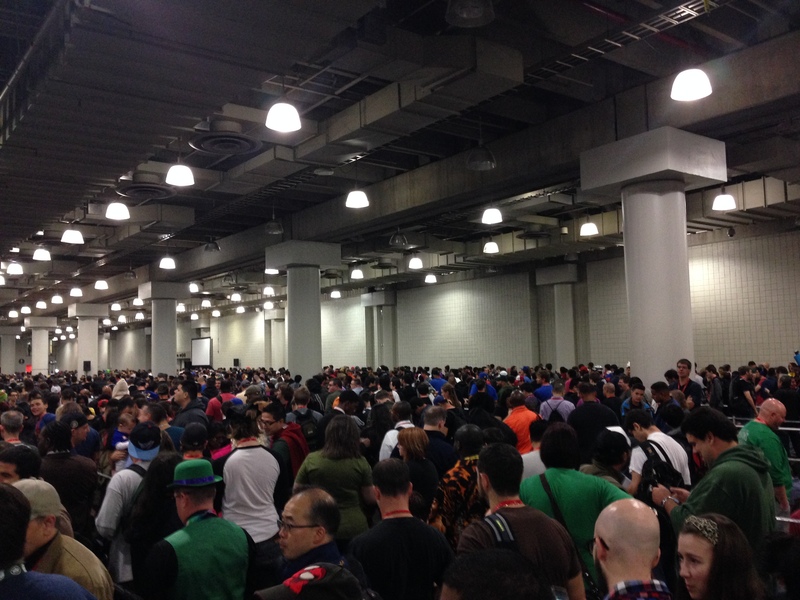 Stay tuned for more NYCC coverage and for those of you here with us, don’t forget to let us know how your con is going.